Life on our family farm was ruled by my hard-driving father. Moving on, I found happiness, but the past left scars. Then, an unexpected discovery allowed me to understand—and forgive. Life on a farm in the 1940s meant hard work, and for the Zellers, it also meant turmoil, as my father’s cold, harsh rule had a profound effect on my brother, my sister and me. Then our wonderful mother fell victim to a mysterious illness. Years later, happily married and living a new life, I made surprising discoveries that revealed answers about my mother’s tragedy and my father’s obsession for his farm. This true story encompasses love, hate, happiness, sorrow, romance, humor and hope. It is about families, understanding the past – and learning to forgive. George Zeller has not only recounted a personal life story but through it, reveals truths that are thought-provoking and sometimes heartwrenchng. There is nostalgia in his look back at an earlier era, but readers will find something different and unexpected, as he shares the insights from his own journey through the years --and surprisingly, also from exploring genealogy! It brought back many happy memories of my own childhood in Upstate New York but still it was difficult to recall many the hard realities of life back then. A painfully honest book about family relationships and how to forgive. George Zeller gives an extremely compelling review of his life’s trials and his road to forgiveness in this wonderfully entertaining and thought provoking book. I would rate this the highest possible mark of 5. George and I were high school classmates. I can confirm that he kept this family background from me, and I assume the rest of our classmates. What a heart wrenching story. The beauty of the story is that through his faith, George found a way to forgive . His life certainly could have taken a much different path! Reviewer: Robert F. Wambach Sr. Although I am a little older than George Zeller, I can relate to many of the life experiences he writes about. Life for my family of six was very difficult during the great depression and well into the years of World War 2. I, too, suffered from asthma as a child, then again later in life. I, too, lived near Rochester, New York, so I can also relate to the places he mentions, especially the Charlotte area on Lake Ontario. George became a family researcher; I have been interested in genealogy for over fifteen years now and still going strong! George "lucked out" and married a wonderful woman. So did I and my wife and I recently celebrated our fiftieth wedding anniversary. A wonderful (but so often sad) story; my purchase of his book was money well spent and I would heartily recommend it to anyone. A very thoughtful and concise look into the private depths of a rural family's life during the 1940's to the present. Surprisingly intense at times as foreboding events envelope the family in tragic and shocking ways in an era when farm life often meant a most difficult and meager existence. A father's dream that did not materialize traveled a malevolent path that tore the dream apart dividing father and family irreparably. It is a tribute to the children that they were able to overcome and reconcile the harshness of the past and enjoy successful and fullfilling lives. The narrative goes on to detail the determination of Mr. Zeller to fashion a highly successful career in the financial industry and his great furtune in meeting his delightful and lovely wife Kate who has been his inspiration and devotion and has given him two children. The book continues to pull surprises, some harrowing, some fullfilling with an interesting synopsis on family genealogy involving even George and Kate. It's a book you'll want to read in one day. It's not every day I read a book by one of my parishioners, but as a priest, I could thoroughly appreciate the tough path the author travelled to forgiveness. This poignant, true-life story is well worth telling, because it belongs to so many people. Every one with a hurting heart should read it. Without being preachy, Zeller places life lessons he has learned within the reader's reach. Faith and optimism triumph and inspire in this refreshingly honest work about the sadness of family life as well as its simple joys. The author is living proof that, in spite of tragic times, his life's story can and will end happily, and in fact already has. George Zeller's Beyond My Father's Farm gets a grip on the reader and simply won't let go. It is an intensely personal family story that most, if not all, of us can in some way relate and identify. In telling his family story, George reveals the most personal of information but does so with grace, tact and style. He describes his family's struggles, failures and successes; internal cruelties and injustices, as well as instances of happiness and sadness. Were it to end there it would amount to an average story of any number of families. But, it does not. George's book tells the story of his mother's struggle with a seemingly unidentifiable demon that literally destroyed and ended her life. It is heart wrenching as George describes his mother's horrible struggle and its affect on the rest of the family. It is unbelievably sad when the cause of the ordeal was revealed. His book is also uplifting as George tells of his own childhood struggles with family cruelties and his ultimate survival and success in both his personal and professional life. In the end it is also instructive as George shares his love of his wife Katie, and his insights into the art of learning to understand, and perhaps most importantly, forgiving. I really enjoyed reading Beyond my Father’s Farm. There were many things I could relate to, having grown up in the cow town’s south of Buffalo, not too far from where the Zellers lived. My favorite story was hearing about George making chicken noodle soup from chicken broth and egg noodles. That made many a meal for our family so I knew exactly what he was talking about. Made me laugh! The book also made me cry – knowing that through it all, Mr. Zeller never lost his faith in God. I had the honor of meeting the author over breakfast one day. I found him and his wife Katie to be a charming, spirit-filled couple who made us very envious of all the traveling they have done. After reading his book, I felt like I knew them even better. I now plan to pass the book on to my in-laws who still live in western New York for their reading pleasure. George Zeller's book tells an interesting story about his childhood while growing up on a farm in New York. George gives the reader great insight into how members of his family dealt with various issues, and how each family member's ability/inability to cope affected his family as a whole throughout childhood and later in life. Beyond my Father's Farm naturally encourages the reader to look back on his or her own childhood, and to gain an awareness of how certain childhood events may have contributed to the reader's general outlook on life. George accomplishes this on an honest, common-sense level and without all the psychological "mumbo jumbo." There are many twists and turns along George's journey, keeping the reader interested and looking forward to the next chapter. George's positive attitude, faith, patience, and understanding have taken him "beyond his father's farm" and into a fulfilling, successful life based largely on lessons he learned along the way. This book is so well written that it just puts you there in his pain where you literally feel every emotion that George was experiencing during his childhood. The book made you think of your own childhood and start questioning your parent’s actions. I wish that I had a chance to read it before that my parents passed away so I could talk to them and understand them better. The book is definitely touching and hard to put down. George has a family now, whom he loves an unconditional love he never had when he was young. Very disturbing, but very proud of the man that George turned out to be. 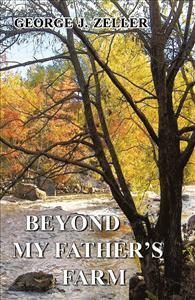 Beyond my Father's Farm was an enjoyable read with a powerful life changing message. Mr. Zeller's use of word pictures to describe his youth provided me with an insightful glimpse into my own past. He used those same pictures to paint a landscape of rolling hills and creek beds that define upstate New York. That same landscape I also explored and enjoyed as a young boy. The message, that through our faith we are able to find the love we need to forgive. And we will remain a captive until we are able to forgive. Well done Mr. Zeller and thank you for a frank and compelling look into your life and past. I worked with George at the bank in Rochester for 17 years. We were close friends then and still see each other periodically. I was aware of some of what he reveals, but not aware of the depth of some of the issues. He does an excellent job of presenting the many challenges he faced both as a child and as a young man. He appropriately gives credit to his wife Katie for the moral support she has given him all through their life together. He acknowledges the contribution she has made to hiis ability to forgive and move on with his life. The book is an interesting read that gives insight into aspects of family life that some of us have never had to experience. It is well worth reading. The style is simple and a fast read (read my copy from Tampa to Charlotte on a plane ride) as the author takes you on the journey of his life. Once completed, you will have a desire to record your own "story" for your family. I found it amazing that the author could recall with such details the cost of money spent throughout his life. Then again, he was in the "banking business" before he retired. Life is short and there are lessons to be learned, God has a purpose and plan for everyone, not letting anything go to waste~ as you will discover as you read "Beyond My Father's Farm". Very insightful. Shows the human spirit can overcome a hard beginning to prosper, forgive, and love. I will be giving a copy to my 22 yr old nephew who believes his life has been hard (not compared to Mr. Zeller's)and continues to believe that it defines him. Maybe he too can learn to thrive and love, himself as well as others. Reading this book brought out so many memories, emotions and at times, tears for me. Mr. Zeller did an excellent job in telling his story. The story takes place in the 1940's however readers of all ages can relate to the sacrfices, struggles, love, forgiveness, joys and sorrows the author conveys. I could not put this book down until I was through reading it, and then, could not wait to tell everyone about it! Great Reading! I highly recommend this book. I am a big fan of murder mysteries but met George and his lovely wife Kate. The pressure was on the read the book. I could not put it down once I began. I would recommend this book to anyone. It is a testiment to personel life struggles, how they can break or bulid a persons character. George Zeller is the intelligent, articulate and cariing man. You get this through his writing without having the pleasure of knowing him. This book should be required reading for youth that are gong through difficult times. It's an insightful and interesting path that George took to get to happiness. He would make a good mentor. It makes us reflect on our own difficult circuntances that we took on our own paths. Beyound being interesting "Beyound My Father's Farm" is also well written. It's one thing to have a story, but another to get down on paper to where oneone would actually enjoy reading it.